Our friends at Voice of Witness are offering an engaging and transformative workshop titled: Amplifying Unheard Voices: The Power of the Story. There’s still time to register for this unique 4-day training, taking place in San Francisco June 20-23. Using oral history as a foundation, Voice of Witness (the nonprofit division of McSweeney’s books) highlights contemporary social injustices by enabling people to speak for themselves. The workshop will highlight the power of personal narrative and provide educators with the tools to conduct oral history projects in their classrooms and communities. The training is geared towards new and experienced educators alike (Grade 8 through college). Workshop participants will engage in an interactive process that introduces the skills, ethics and social significance of creating oral history, as exemplified by Voice of Witness and other leading practitioners in the field. Interested in learning more? Join Voice of Witness for their upcoming Educators’ Open House on Tuesday, May 10 at 826 Valencia in San Francisco, from 6-7 pm. 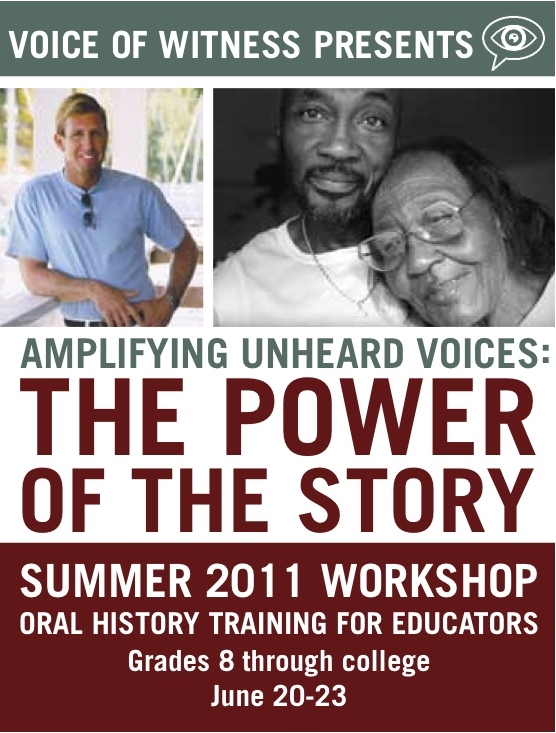 To register for Amplifying Unheard Voices or for more information, please contact Voice of Witness Education Program Director, Cliff Mayotte.